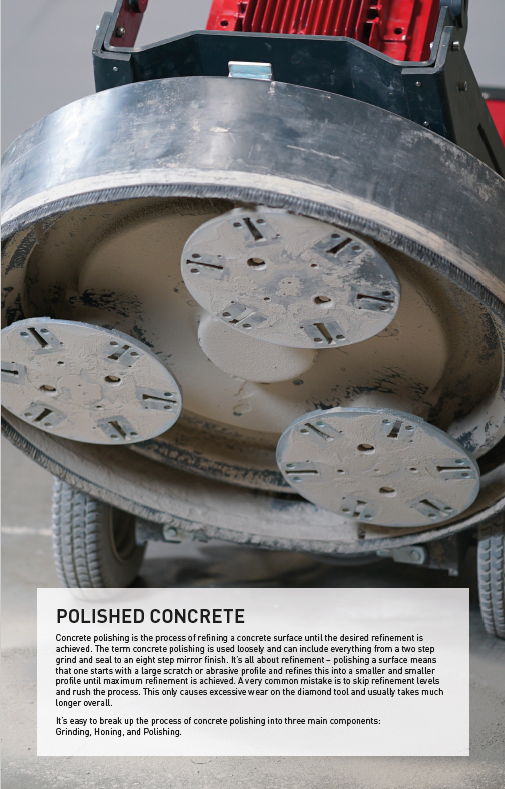 Scanmaskin presents the World Series floor system – concrete polishing made easy. 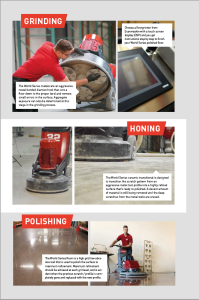 When it comes to polishing a floor, there are two important things to remember. These are to set the customers’ expectations and start with the end result. Anna-Lena Lööf, Marketing Director at Scanmaskin, describes the difficulty of today – “Today there are many customers that don’t know what polished concrete is and the steps to create the expected end result. 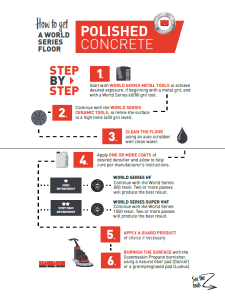 Therefore, we have chosen to create a simple step by step guide to facilitate our customers process in polishing a concrete floor.” “How to get a World Series floor”. The World Series system is a premium selection of products that have been created for our customers’ demands all around the world. The development of this product range is focused on quality, service and reliability. Last year we released the Scanmaskin 32 and Scanmaskin 28 machines in different versions which have been a great success, and was rewarded with the 2018 years best innovation. After much testing together with our customers, we have now also released a complete World Series tooling system including World Series Metals, World Series Ceramics and World Series Resins. 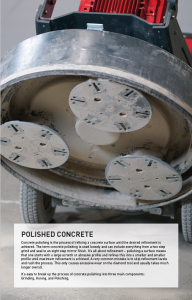 The World Series floor guide for polished concrete combines the results of our extensive testing, together with a complete range and explanation of the tooling you need for the job. The easy step-by-step guide helps you achieve the ultimate finish every time. It includes three different systems that each can be used to achieve a matte, glossy, or super glossy finish. We call them World Series Matte, World Series HF (high refinement), and World Series VHF (Very high refinement). 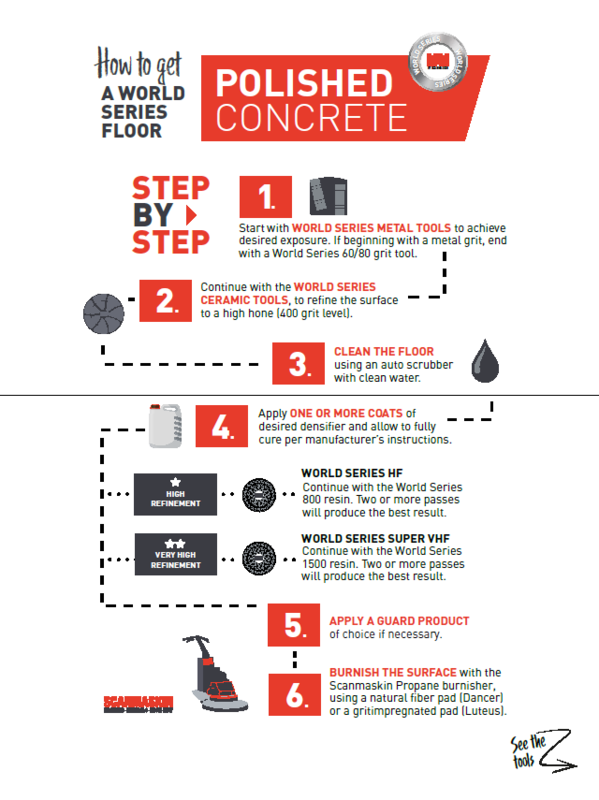 The World Series floor system will be first launched at the annual World of Concrete show in Las Vegas USA, 22-25th of January 2019. The focus for the World Series Metal tools by Scanmaskin has been to achieve maximum productivity while providing good longevity. The ”W” shaped segments increase the airflow around the tool, which helps prevent overheating and glazing. is ensures better longevity and higher productivity for the tool. The World Series metal tools are available in four different bonds. The World Series ceramic tools are specifically designed to transition from a metal diamond to a resin polishing tool. The unique low-profile design and high crystal density allow these tools to contour to the surface while achieving maximum refinement at the same time. The World Series ceramics can also be used as the first step for a cream or salt/pepper finish, eliminating the need for a metal tool. The Soft bond option works well on floors testing at 6-7+ on the Mohs scale. Five grits are available: 50, 80, 100, 200, 400. The World Series resins are designed to achieve the final mechanical refinement on the surface, using diamond powders bonded in a resin matrix. The World Series resins are engineered to transition from a honed surface to a highly polished surface with minimal steps. Seven grits are available: 50, 100, 200, 400, 800, 1500, 3000. Scanmaskin is a dynamic, progressive organization based in Sweden. Since 1975 we have manufactured market leading floor grinding-, surface finishing and polishing equipment. All our grinders and dust extractors are produced in our facility in Lindome, on the outskirts of Gothenburg. The development of new models has been based on current market demand and industry trends from customers all around the world. We combine this input from our user base along with Swedish engineering, and have created a platform with increased productivity and functionality. As always, we bring in our core values in our organization and products.